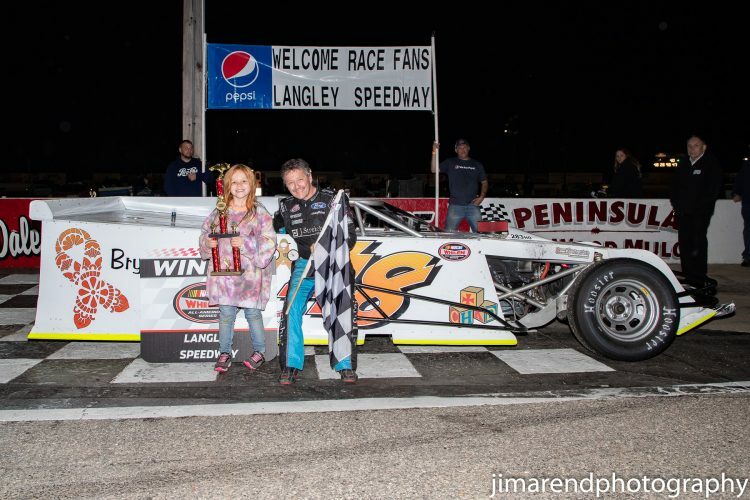 Coming in hot after last weekend’s exciting season opener, five more race divisions were on the schedule to begin their 2019 season campaigns at Larry King Law’s Langley Speedway. ERA Real Estate Winged Champ Karts were back this year as well as the Riverside Paper Pro Six’s. Also returning were the Old Skool Video Games Super Streets and the Larry King Law’s Modified’s who had twin races for the evenings fair. New sponsor for the Enduros’ division in 2019 as they would welcome Parts Barn to Larry King Law’s Langley Speedway to begin their race season. So, after a drizzly morning to start the day, the bright sun gave way in the afternoon. Then the lights came on and the fans took their seats, here’s a recap of the evening’s racing and how it all went down. ERA Real Estate Winged Champ Karts 20 Laps: Aaron Leach would begin his race season by taking the pole for the race. With a pole qualifying lap set at 23.185 seconds, Chris Bechtel was only off a mere six thousandths of a second to start shotgun in the grid. Fast laps from David Millard, Matthew Leach and Mattisen Morrill rounded out the top five qualifiers. Green flag waved as the sun began to set over the turn three wall and coming around to lead lap one would be the pole setter Aaron Leach. By lap two, a three car tandem developed with David Millard and Mattisen Morrill all nose to tail with the leader. On back, several were having troubles organizing allowing the leaders to get away. At the halfway, the tandem at the front was down to two karts when Morrill lost the draft. Laps later saw an effort mount from the middle of the pack but it would come down to the leaders Aaron Leach and Davey Millard. With a last lap pass, David Millard claimed the checkers. Millard had this to say in Victory Lane, “That was exciting, did some changes on the car and got the car handling better. I got a lot of people to thank, gotta thank the Leach family. I was struggling a bit last year and they helped me out big time. Thank my brother Danny, thank my wife for allowing me to do this and thank everybody for coming out and supporting HRKC”. Larry King Law’s Modified’s Twin 40’s: Shawn Balluzzo had the fast hot rod by earning the pole scoring a 15.961 second lap. Rival Matt Carter would occupy a share of the front row with his effort. Bubba Johnston, Jamie Sample and Kyle Wood were the Modified series best five in qualifying. Green flag was in full display and settling the first lap battle would be Shawn Balluzzo in the lead. Carter, Johnston and Sample would mirror every move of the race leader all nose to tail. Laps later, Balluzzo began to separate himself and soon showed a five car length lead. But then the caution as Jamie Sample would go around while running fourth in the grid. Back to the restart, race leader Balluzzo made quick work to retain the lead leaving the rest to sort it out on back. Halfway went up on the board and so did the races second caution when debris were to blame. Back to the racing, Balluzzo had another great start, Bubba Johnston would take second as Carter held third and joining the fray was Bobby Gery in fourth. The last half of the feature would go caution free as did the race leader Shawn Balluzzo who would go on to win the first Modified feature of the season. In the second feature, NASCAR’s mandatory eight car invert was applied to the grid with race winner Shawn Balluzzo electing to start at the rear for max points. Green flag was given to the field and assuming the top spot would be TJ Largena who lead the field into turn one. Largena easily secured the point and just as lap one is complete, the caution flag waves as Matt Morgan comes to a stop on the backstretch. Back to the green, the so called big one shuts down the racing to bring out the second caution. Matt Carter, Danny Harrell, Bubba Johnston, Louis Pasderetz, Grant Blasingame and Rick Gdovic all involved. After a lengthy caution, green flag racing returned to the track with Kyle Wood winning the restart and the race lead. Laps later in the run showed Wood built up a six car length lead. Benefitting from the earlier cautions and the cone restarts was Shawn Balluzzo up to fourth from starting in the rear. At the halfway things got a bit interesting when Balluzzo would get into Bobby Gery to bring out the caution. Balluzzo would be cited for rough driving and forced to the rear on the ensuing restart. With the green waving once again, Kyle Wood continued as the leader. But then came Jamie Sample to take the lead bringing Matt Morgan along with him. Out front, Sample created a ten car length lead while on back, all eyes were on Balluzzo coming to the front showing third. With nine laps remaining, the caution flag waved when Bobby Gery hit the wall hard. Final restart, Jamie Sample as the leader had to deal with Shawn Balluzzo who haunted the leaders every move. But soon after and perhaps just a matter of time, Shawn Balluzzo took the race lead. From there, Balluzzo would go on to sweep the Modified twin races. Balluzzo in Victory Lane, “I appreciate all the fans who came out tonight, the weather didn’t look good but we really appreciate the fans for coming out. Want to thank all the competitors for racing really clean and with all this mouse trap stuff, we really have fun with it”. Riverside Paper Pro Six 30 Laps: Eric Schaffer had the highlight lap at 16.933 seconds and claimed the series pole. Jared Clarke would start second in row one when the green flag waved and emerging from the first corner with the lead would be the pole setter Eric Schaffer. Just after the first completed lap the caution flag would wave as Jared Clarke would go around courtesy of JB Sipe. Back to the green, Schaffer would get the good restart but soon in the lap, Bobby Hall would take advantage of the leader slipping in turn four to take the lead. JB Sipe overcame an earlier penalty and would show third in the grid as the halfway soon drew near. But at this point, Bobby Hall had created a sizable lead over Schaffer running second. With six circuits remaining, Eric Schaffer got the caution he was hoping for bunching back up the field for one last shot at the leader. With the green back in the air, Schaffer gets aggressive with the leader as contact ensues. Surviving the restart and the bumper of Schaffer, Bobby Hall goes on to win the Pro Six feature. Hall in Victory Lane, “Man we’ve gone through a lot of stuff in the past two years. We were winless last year, a lot of bad stuff happened but finally, this car was perfect. It finally was hooked up, it was bad fast, we thought we were going to miss qualifying but laid down a decent lap just to get in the field. Man, there just so many people to thank, I almost want to cry, it’s been so long, so much stuff has gone on”. Old Skool Video Games Super Streets 40 Laps: In Super Street qualifying, Colby Vance had the fast lap to take the series pole with his 18.388 second effort. Landon Abbott earned the two spot on the front row with Renno Marchetti, Gordon Weeks and Dale Parro completing the top five in the afternoon time trials. The green flag waved to a strong field of Super Street competitors and quickly to the front would be the pole setter Colby Vance. Both Landon Abbott and Renno Marchetti made quick peeks under the leader but soon fell back in single file. Once single file, Abbott would make his second peek at the leader and made it work as he then took over the race lead. The race experienced its first caution as fluid was on the track which was coming from the race leader who had to come to pit road. At the restart, Renno Marchetti assumed the race lead and easily secured the point by turn two. After another brief caution, the race resumed with Marchetti leading the feature. Finally, the racing had settled down and green flag laps were mounting. Making moves and working towards the front were Dale Parro and Randy Akers as the halfway went up on the board. Meanwhile, Marchetti in the clean air had put some distance between himself and Colby Vance. Final laps of the event showed Vance nipping at the lead but Renno Marchetti proved to be to much as he would go on to win the first Super Street feature. Marchetti from Victory Lane, “I thought something felt funny on those restarts I guess it is the transmission. Gotta thank Langley Speedway and the fans for coming out, gotta thank everybody that helped me, my wife, my parents. I was looking forward to racing with my teammate but I guess they didn’t want that to happen. Congrats to Colby Vance, heck of a first day”. Parts Barn Enduro’s 30 Laps: In a race division determined by pill draw for its starting grid, Hunter Collins would get to lead an impressive thirty one car field to the green. Emerging out of turn two with lead would be Richard Quinn as the wrecking began. Managing to stay green, early movers Alex Floroff and Charlie Bryant were working towards the front. Then after a brief car clean up to clear the track, the race resumed as Richard Quinn continued to show the way. Alex Floroff soon was able to clear Donnie Massingo for second who then could focus on the leader. Lap traffic proved to be an issue for the race leader when just shy of the halfway saw Alex Floroff take the race lead. Bill Eaker made his way through the field and into the second spot late in the run. But could never get the help from lap traffic to make a pass, Alex Floroff wins the Enduro race feature. Floroff from Victory Lane, “I didn’t even know, all I saw was a big orange car coming. I’m surprised I got here (Victory Lane), it was a heck of a race with thirty three cars in this field, it was a great win. Gotta thank my wife for letting me play out here at this great track. Thank my dad, thank the fans for hanging around to watch us race”.